The Collect of the Royal Army Chaplains' Department. Labarum is the name by which the military standard adopted by Constantine the Great after his celebrated vision (Lactantius, "De mortibus persecutorum", 44), was known in antiquity. 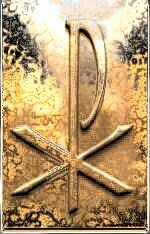 The original labarum, designed under the emperor's direction on the day subsequent to the appearance of the "cross of light", is described by Eusebius (Vita Constant., I:26) as "a long spear, overlaid with gold", which with a transverse bar formed the figure of a cross. "On the top of the whole was fixed a wreath of gold and precious stones, and within this the symbol of the Saviour's name, two letters indicating the name of Christ by means of the initial letters, the letter X intersection P at the centre." These two letters formed what is known as the monogram of Constantine, so called -- not because it was the invention of this emperor, for it had been a familiar Christian symbol prior to his conversion -- but because of the great popularity it enjoyed from the date of its appearance on the imperial standards. 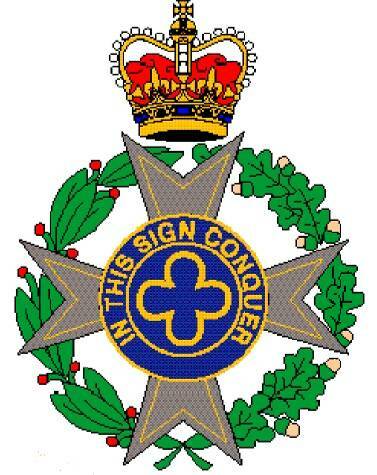 From the cross-bar of the spear, was suspended a purple banner with the Greek inscription TOUTO NIKA -- i. e. conquer by this (sign), usually rendered in Latin "In hoc signo vinces" - "In this sign conquer", the motto of the Royal Army Chaplains' Department. This banner, square in form, covered with a rich embroidery of precious stones, and "being also richly interlaced with gold, presented an indescribable degree of beauty to the beholder". The part of the staff immediately above the embroidered banner was adorned with medallions of the emperor and his children. The monogram was often enhanced with and Alfa-Omega, the first and last letters of the Greek alphabet signifying Christ the beginning and the end. Fifty soldiers of the imperial guard, distinguished for bravery and piety, were entrusted with the care and defence of the new sacred standard (Vita Constant., II:8). Standards, similar to the original labarum in its essential features were supplied to all the legions, and the monogram was also engraved on the soldiers' shields. An idea of some of the deviations in form of the standards furnished to different divisions of the army may be obtained from several coins of Constantine's reign still preserved. On one coin, for instance, the portrait of the emperor and his sons are represented on the banner instead of on the staff; on a second the banner is inscribed with the monogram and surmounted by the equal-armed cross, while the royal portraits, though on the shaft, are below instead of above the banner. In form, the labarum of Constantine was an adaptation of the already existing cavalry standard of the Roman army; the pagan emblems were merely replaced by Christian symbols. The term labarum, which is of uncertain derivation, was probably familiar in the Roman army from the reign of Hadrian. These texts are drafts of services presented ready for printing. They are from Common Worship and from the Liturgical Books of the other "Sending Churches" of the Royal Army Chaplains' Department (RAChD). They may be used by Chaplains, and by others, within constraints imposed by copyright law. - big font, but can be awkward to hold. – size fine for the young – easy to hold. 3.A folded A5 Booklet – nice to use, but more difficult and more expensive to make. The A5 booklet is set at 11.5pt or 12 pt - use a photocopier to increase it to an A4 (folded A3) booklet, and an Altar Book is produced. Reduction to A6 (folded A5) produces a pocket booklet which is still very readable. For Common Worship material no original should be used to generate more than 500 copies unless special permission is sought. All texts should have the name of the church inserted before they are reproduced locally. They then be come new documents. Advice for those looking for a quick solution. - whether your congregation (and visitors) are more likely to be helped by something that looks as simple and short as possible (with just congregational texts, for instance) or by something in which the congregation have all or most of the words spoken by the minister, as well as their own words etc, etc. This is very important: otherwise, the temptation is to follow someone else's beautiful design, which is right for their context but not necessarily for yours. For instance, when leading training sessions about designing orders of service I often show examples which are pretty stunning (beautiful card covers on booklets printed on top quality paper, reproduced on professional quality laser or photocopier) - many in the group will be impressed, and then someone will say something like 'That looks great: but if we used that in my parish visitors (and regulars) would just think that we had been wasting money that we should have been spending on the Sunday School [or whatever]... ' - in other words, in some contexts it would be TOO impressive and something good, but not extravagant, would be more appropriate. This is the whole point of being able to produce our own orders of service: to make sure they fit particular needs and particular mission contexts. That shouldn't stop you cribbing other people's ideas if they will work for you - it just means making sure that your Common Worship working party doesn't stop at considering the text alone: so many other factors come into play...! Provided WINZIP is correctly installed clicking all the obvious buttons will result in a text loaded into your chosen Word Processor. If you have never loaded a Rich Text Format File before you may be asked to choose the program to open it - choose the word-processor, not a Windows Text Editor. The native format of most of these these documents is STAR OFFICE 5.2 for WINDOWS, although some are edited with Star Office (Open Office) version 6 or 7, and some are drafted in MS WORD 2000. There is a lack of consistency in this collection because many of the files were created for local use in a particular situation and then converted for general use before uploading to Labarum. The MICROSOFT RICH TEXT FORMAT (.RTF) and MS WORD 97/2000 (.DOC) files cannot be guaranteed to format or paginate correctly, and should be carefully checked. With complex layouts there can be problems even reading a document on a copy of the program that wrote the file. This is because the layout can vary significantly depending on the printer-driver loaded. You may open a document that starts with a blank page - look more closely - it is probably all there. The three column layout of the fan-fold cards is particularly fragile. Note that the Service begins at the top of the third column of the first page and ends at the bottom of the second column of the first page. It may prove difficult to get the text properly positioned if you are not using a laser printer. Inkjet printers cannot print as close to the bottom of the A4 (portrait) sheet as laser printers. In landscape mode the layout may be displaced sideways - the problem may also affect the Acrobat (PDF) files. Some of the latest inkjet printers have overcome this limitation, but the feature needs to be turned on in the printer control software. An ADOBE ACROBAT distribution is often available. These files have the extension .pdf - Portable Document Format. It does not suffer from the problems of other formats, but it cannot easily be edited. You take it or leave it! It should produce identical layout on any system. The pages will be in the correct order to make a booklet. The download time can be 30 seconds, or more for the largest booklets, so do be patient. Booklet printings is perhaps the most difficult technical problem encountered in the production of liturgical material. Star Office was chosen for much of this work because it is free, and will format folded booklets automatically. WordPerfect, Lotus WordPro and some other word-processors can do this, but MS WORD before Office XP cannot. Desktop Publishing Packages will also print booklets, but they increase the complexity of the operation unnecessarily. Most programs sort out the page layout once the document is complete, but Word XP requires that a booklet be specified as the page layout option before the document is started. Star Office is, no longer free, but an almost identical program, Open Office is free for download from www.openoffice.org It may take an hour or more with a 56K Modem so you may be wise to install a download manager before attempting it. This will allow the download to resume automatically if the modem drops out. Try this download manager: www.speedbit.com, it is one of many. Open Office installs in Windows very easily. It will read and write MS Word files and will do all that most folk need. Some booklets will print at A4 size from the WORD and RTF files - from the STAR files too, unless you use the "PRINT - BROCHURE" option. Without a brochure or booklet printing routine you will end up with an A4 Altar Book size using 17pt. Star (or Open) Office reduces and rotates the pages, laying them two to an A4 sheet in the right order for reproduction. A utility such as www.clickbook.com will do the same for MS Word and other programs – but it costs money! Word 2000 (though not Word 97) is fine for booklets provided 2 pages per sheet is enough. Go to Print, and in the dialogue box set the 2 pages per sheet option. Go to the Page Range section of the Print Control dialogue box. and specify the order in which the pages are printed on the A4 sheets. Set print pages 4,5,2,7 - you must enter it just like that with a comma between each page number. Now take all the pages, turn the the lot over and replace them in the printer tray to print the other side. You still have to work out for yourself the order of printing, and it can get very complicated for bigger booklets. Last week we showed how with a little cajoling, Microsoft Word could be persuaded to print an A5 booklet. As we suggested there are easier ways of doing it, including using other word processing and desktop publishing (DTP) software, which we'll come to shortly, but we'll begin this week with quick look at a couple of utilities that can make Word -and most other word processors and Windows applications - a lot more booklet friendly. The programs in question are FinePrint 2000 and ClickBook 2000; trial versions can be downloaded from various sites on the Internet, so you can try them out for yourself (see Contacts for details of the publisher's home pages). Both programs are independent of Word, in other words you prepare your text and documents in the usual way, the utilities only come in to play when you get to the printing stage. In both cases the procedure is the same, select Print on Word's File menu and choose the utility program from the list of printer names installed on your PC, or the program can be set as the default. This opens a dialogue box, you set your preferences and the program takes control of page setup, layout and collating sheets for double-sided printing or single-sided photocopying. (See last week's Bootcamp for a more detailed explanation of the mechanics of booklet printing). FinePrint is the simpler of the two programs, it has 6 pre-set layouts and it comes with an interesting assortment of 'stationery' options, these include clipart designs, watermarks or stamps like Urgent or Top Secret plus a range of header and footer options. Booklet printing is set to automatic 'duplex' or double-sided printing by default - a trick few SoHo printers can manage - but it can be easily changed to manual duplex printing, which entails the user waiting for the printer to print on the first sides of the document, then manually re-load the sheets so the other sides can be printed The demo version of FinePrint is limited to layouts with a maximum of 8 pages and it tags every page with 'Printed with FinePrint. . .' the full program can be paid for registered and unlocked on-line for $39.95. ClickBook is very versatile and includes 8 design categories (books, brochures, cards, organisers, CD-ROM jewel case inserts etc.) covering more than 40 different types of layout. It's almost a mini desktop publishing application in its own right, booklet printing is only one of its talents and there are many style and design options, including the facility to generate a table of contents, add page numbers, lines, borders and rules. Operation is perfectly straightforward, and the job of double-sided printing is made a little easier as ClickBook generates a guide sheet, that tells you when and how to re-load printed sheets for a second pass through the printer. A time limited (5-days) trial version, that also labels each page with the ClickBook name, is available from the Blue Squirrel web site, full functionality can be unlocked on-line for $49.95. The majority of word processors are like Word and make fairly heavy weather of booklet printing; one of the few exceptions is Lotus WordPro, which has a ready prepared template or 'SmartMaster', designed to help the user through the design and layout stage. The SmartMaster wizard starts whenever WordPro is opened, or it can be called up from the File menu, however on some versions booklet printing option is not listed on the main menu and we suspect some users may not even know they have it. To find it click on 'Browse for more Files'. Whilst it is reasonably easy to use it is well worth perusing the Help files on the subject and it may be necessary to configure some printers manually. A time-limited trial version of WordPro is available from the Lotus web site. Booklet printing seems like an obvious application for desktop publishing software, though surprisingly not all DTP programs have it, and that includes some of the top-name pro packages. It's worth checking through any freebie or 'lite' versions of DTP or design and print programs you may have, which are routinely bundled with a lot of printers, scanners and PCs these days. Serif PagePlus is pone of the most popular DTP applications on the market; shareware versions also appear regularly on PC magazine cover discs. PagePlus can certainly do the job, but like so many programs the option is well hidden. It can be found by pressing the Options button on the Print dialogue box on the File menu. It's not as intuitive as some of the other programs and it may require a few trial runs to get the page layout right but with a little practice it's capable of good results. However, the advantage of using a DTP program, as opposed to a word processor or printing utility is the greater flexibility when dealing with illustrations, images and text. All the Bootcamp articles are worth consulting for technical advice on PC use. Go to the main Telegraph site and look in the "Connected" section. Hunt for the Bootcamp archives in the Technology section. I do not link here because the DT site is regularly reorganised. You may need to register with the Telegraph to access these pages, but it is free. The hardcopy already distributed to army chaplains was produced with the help of the Draughtsman and the Repro. Unit in Colchester Garrison- I thank them, as I thank the Repro Unit in Arborfield Garrison, who have continued the work. This website has been put together with the help of my son, Luke who was 15 when we began, and to whom I extend my grateful thanks. I also offer my thanks to those members of Christians on the Internet (COIN) who are continuing to offer advice on the development of this site. I particularly thank The Reverend Alan Jesson for his encouragement, not least because he is the membership secretary of COIN www.coin.org.uk and would love to sign you up, but also because he is a Chaplain of the Army Cadet Force, and a long standing member of the RAChD. I thank the Andrew Leach, Webmaster of Christchurch, Eastbourne www.xpeastbourne.org for his support and encouragement. He has produced a superb set of parish booklets which all should view, and carefully note. The booklet style will adapt to many styles of worship. I offer these texts freely and without any warranty. I am only too aware of the imperfections; but I hope they will assist you in your ministry. Please use this resource freely while respecting copyright law.